Set ten years after the events of Days of Future Past, the mutants are now known around the world. Some are still in hiding while others are at Professor Xavier's School for Gifted Children. The events of the last movie are still on everyone's minds, Magneto has gone into hiding from the damage he has done and has started a little family. But things get grim and he becomes the evil Magneto we all know too well. Next, we see who the Apocalypse is, and the type of power he possesses. He can collect other mutant powers and when he is about to die he chooses a new host to live longer. Things go awry back in the ancient pyramid days and he undergoes a deep sleep. Then in the 80's he is accidentally awoken and his reign upon the land begins. Apocalypse sees himself as a god and decides to destroy everything on the earth. The only thing standing in his way are the X-Men. X-Men Apocalypse introduces new characters and those we know from the previous film. It's good vs. evil and those on Professor X's (James McAvoy) side are Hank McCoy/Beast (Nicholas Hoult), Raven/Mystique (Jennifer Lawrence), Moira Mactaggert (Rose Byrne), Peter Maximoff/Quicksilver (Evan Peters), Jean Grey (Sophie Turner), Scott Summers/Cyclops (Tye Sheridan), Alex Summers/Havok (Lucas Till) and Kurt Wagner/Nightcrawler (Kodi Smit-McPhee) and with Apocalypse (Oscar Isaac) enhancing the powers of his team, Eric Lehnsherr/Magneto (Michael Fassbender), Angel (Ben Hardy), Ororo Munroe/Storm (Alexandra Shipp) and Psylocke (Olivia Munn) his "Four Horsemen," it turns into a hard fought battle. We get to see many backstories and some characters will surprise you. All in all this movie is definitely worth watching and from the trailers you do get a brief cameo of Wolverine (Hugh Jackman) tearing people apart so that was nice to see. 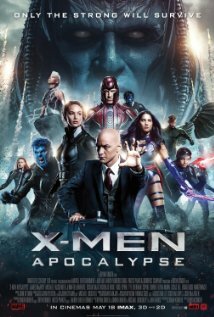 X-Men Apocalypse had good story but some acting was plain in some parts. Not to spoil the ending, but it will be familiar to fans of the franchise. There is another X-Men movie set to come out, but in the 90's. At this point I don't' know what else they could do with the story so we'll see. Worth watching and enjoy the ride.